Common sense says salmon recovery efforts should focus on the most important factors that control fish population dynamics. In reviewing Central Valley population dynamics, I have seen each life stage and each individual controlling factor become important at one time or another. In my experience, the estuarine rearing and migrating stage is an essential component that is not given enough attention. Central Valley salmon populations are nearly all “ocean-type” Chinook salmon, meaning they move to the ocean usually during their first six months of life, with substantial estuary rearing as fry, fingerlings, and pre-smolts. That is not to say that yearling smolts contributions are not important. It is that they are a minor contribution in “ocean-type” Chinook (note that late-fall-run are “river-type”). I have always believed the survival of wild salmon fry in the Bay-Delta to be a key limiting factor in wild salmon production in the Central Valley. Hatcheries have kept smolt numbers to the ocean up, while the survival of wild salmon eggs, fry, fingerlings, and smolts has worsened. Fry-fingerling estuary survival is important, if only in the sense of sheer numbers and the resulting potential to increase overall smolt production. This is true for fall-run, spring-run, and winter-run populations. There is substantial evidence that returning wild adult salmon are predominantly from the estuarine-reared groups. Such evidence exists from fish surveys, scale analyses, and genetic studies. Thus, a recovery program for wild salmon should include a strong focus on estuarine rearing and survival. 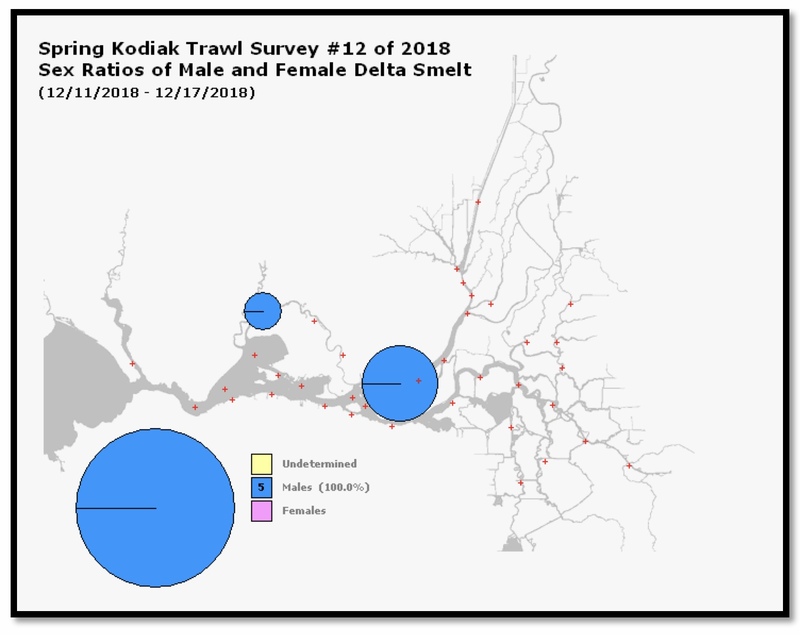 My beliefs are shaped in large part from my personal experiences in conducting winter seine and screw trap surveys throughout the Bay-Delta and lower rivers. Young wild salmon classified as fry and fingerlings, 30-50 mm (1-2 inches), dominate the inshore landscape and screw trap collections. Millions of fry and fingerlings pour out of the spawning rivers and tributaries into the main rivers and into the Delta, where they dominate the winter fish community. Larger, more elusive pre-smolts, mostly winter-run, are also present in smaller numbers, but in numbers important to the winter-run population. Yes, there are millions of fry left to rear in highly regulated and disturbed river habitat, but their overall numbers are fewer, with less potential for ultimate survival to smolts entering the ocean than their estuarine counterparts. One of the better indicators of the general pattern of estuarine use by salmon is fish salvage collections at the massive federal and state pumping plants in the south Delta. As shown in Figure 1, December is important in the estuary for winter-run and late-fall-run pre-smolts and yearlings, respectively. The January through March period is important for spring-run and fall-run fry/fingerlings. The April through June spring period is important for spring-run and fall-run pre-smolts. To support juvenile salmon in the estuary, Delta habitat therefore needs protection from December through June. Natural flows and flow direction patterns are important habitat features. Water temperature is important in late spring. Exports affect such habitat, especially in dry, low-flow years. The State Water Resources Control Board is in the process of revising water quality standards in the Bay-Delta watershed.1 Salinity, flow, water temperature, and export-limit standards need updates to protect salmon using the Bay-Delta through the winter and spring. Such protections will be key to wild salmon recovery in the Central Valley. Figure 1. Salmon salvage at south Delta pumping plants in 2011. 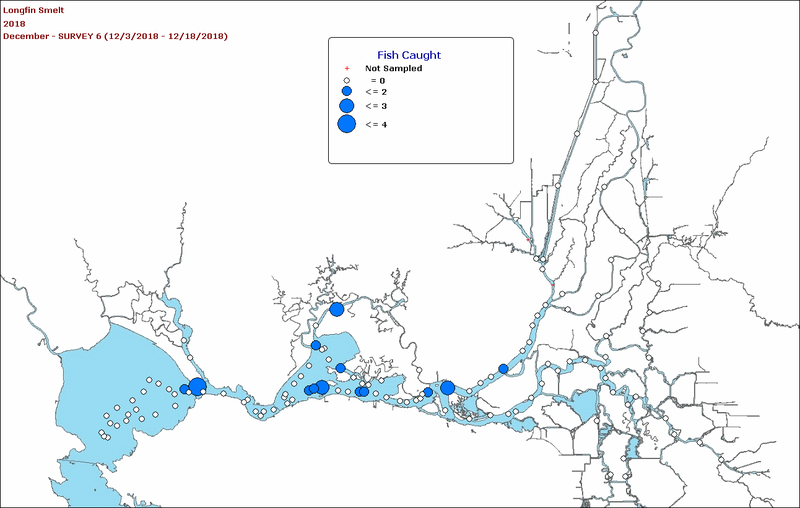 Note red-outlined groups of predominately wild salmon. 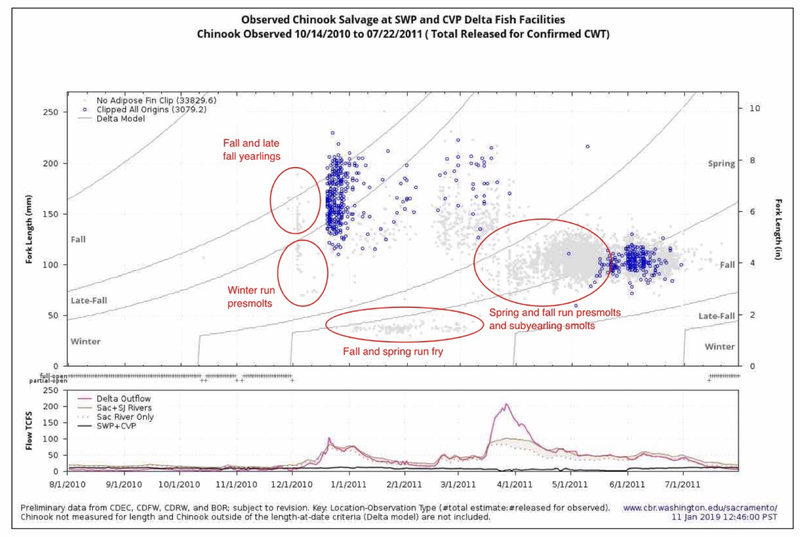 Blue dots depict salvage events for hatchery salmon. 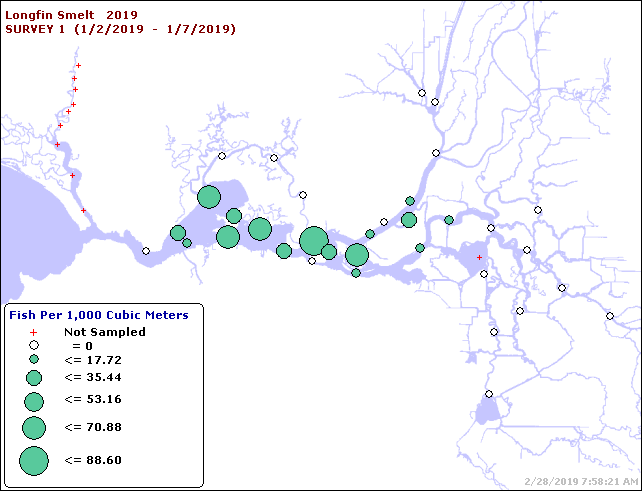 A February 20, 2019 article in the Eureka Times-Standard reported continuing improvement of Klamath River fall-run Chinook. “The number of natural area spawners was 53,624 adults, which exceeded the preseason expectation of 40,700. However, the stock is still in “overfished” status as escapement was not met the previous three seasons. The estimated hatchery return was 18,564 adults for the basin. In a May 2017 post, I discussed an increasing contribution to the Klamath run from the Shasta River. 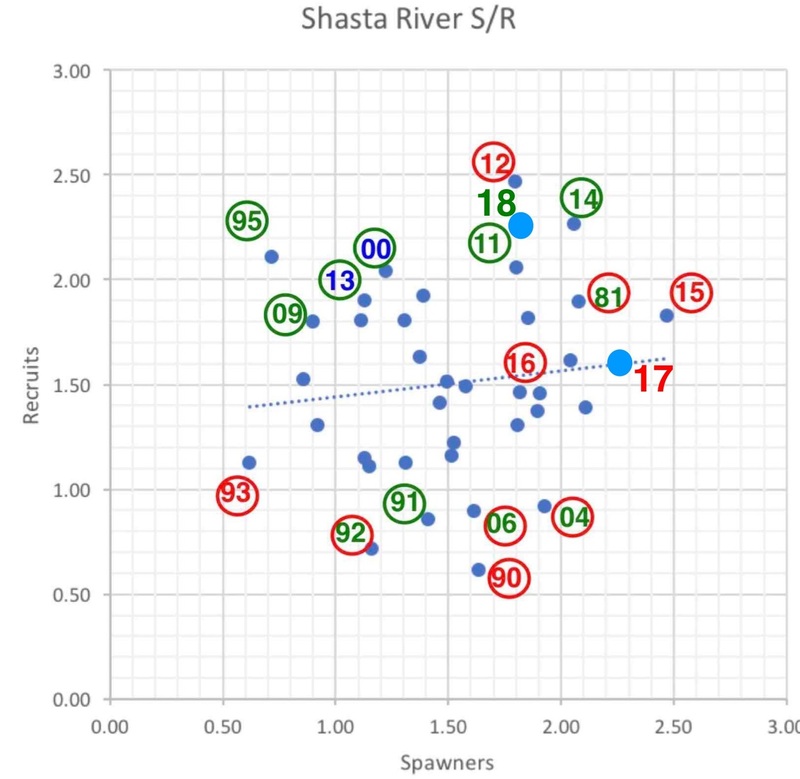 In Figure 1 below, I have updated my original spawner-recruit analysis from the prior post with 2017 and 2018 escapement numbers for the Shasta River. The Shasta run in fall 2018 was third highest on record for the Shasta River. The river’s fall-run population continues to benefit from improved water management. Coho salmon and steelhead have yet to show significant improvements (Figure 2). While some will argue the relative values of ranching and fish protection, I see no grounds to argue that changes in water management have not been positive to the Shasta River and Klamath River salmon. 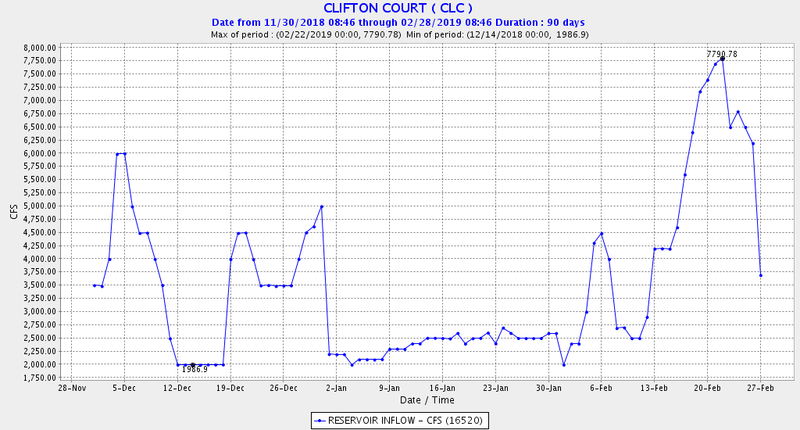 Summer flows in the river below the ranch appear to have improved over the long term average (Figure 3). Many of the Shasta River’s Chinook and Coho salmon spawn in the Big Springs area and in the river below Big Springs, and depend on flow and cold water input from the springs. Even with the contribution of this flow, water temperatures are marginal (>65oF) for young salmon from May to September (Figure 4). 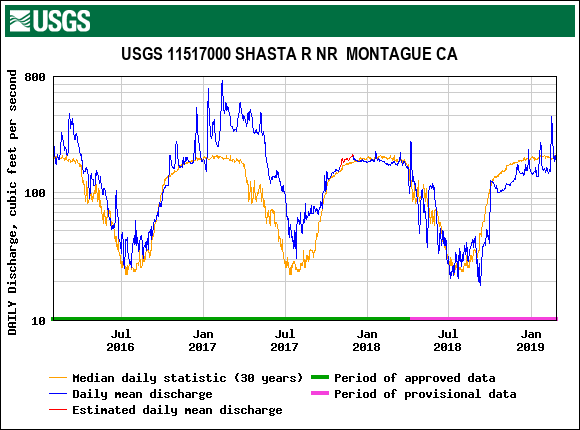 From my perspective, the loss of several thousand acres of irrigated pasture out of roughly 25,000 acres in the Shasta Valley seems a small price to pay for a large step towards the recovery of Shasta and Klamath River salmon. Figure 1. Spawner-recruit relationship for Shasta River. Escapement estimates (log10X – 2 transformed) are plotted for recruits by escapement (spawners) three years earlier. Year shown is recruit (escapement) year. 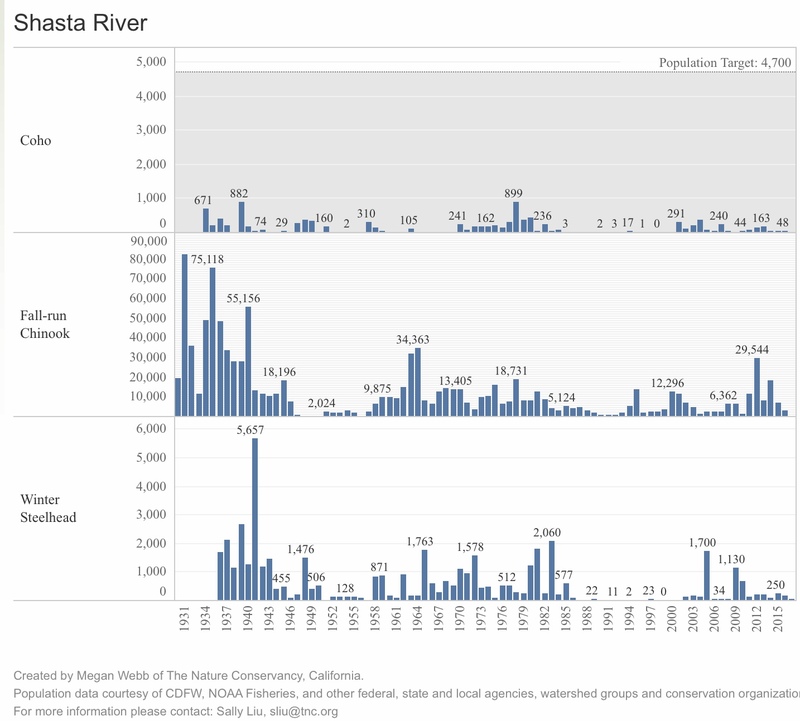 The number is the year that fish returned to the Shasta River to spawn. The color of the number depicts the water-year type in the Shasta River during the year the recruits reared. The color of the circle depicts the water-year type in the Klamath River during the year the recruits reared. Blue is for Wet water-year types. Green is for Normal water-year types. Red is for Dry water-year types. Example: 90 depicts fish that returned to the Shasta River as adult spawners in 1990. These fish were spawned in 1987 and reared in winter-spring 1988. The red number shows that the 1988 rearing year was a Dry water year in the Shasta River; the red circle shows that the 1988 rearing year was a Dry water year in the Klamath River. 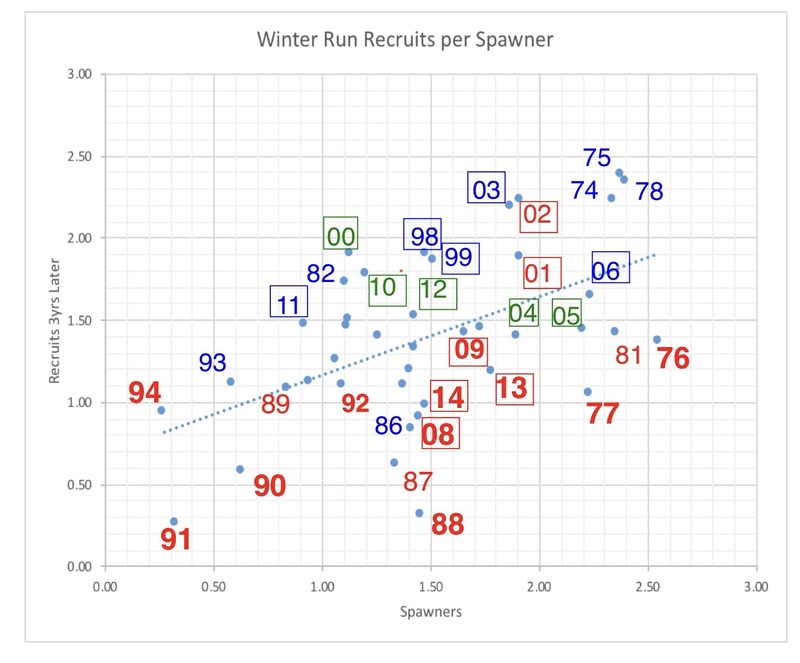 Note very poor recruits per spawner in 1990-1993 drought period, compared with relatively high recruits per spawner from 2011-2018, even though the latter period included the 2012-2016 drought. Figure 3. 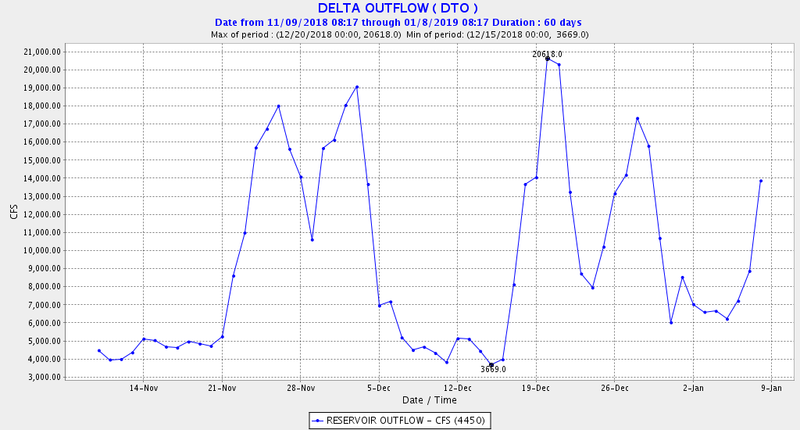 Shasta River flows in the Shasta River below Big Springs 2016-2018 with 30 year average. 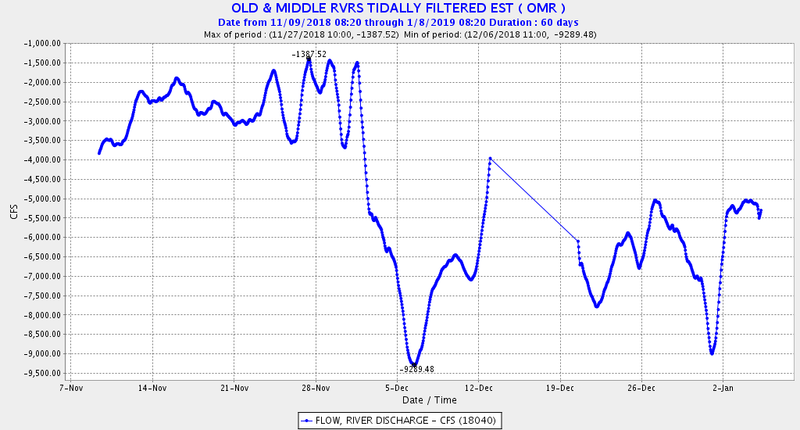 Note summer base flow appears to have improved by approximately 10-30 cfs. Figure 4. 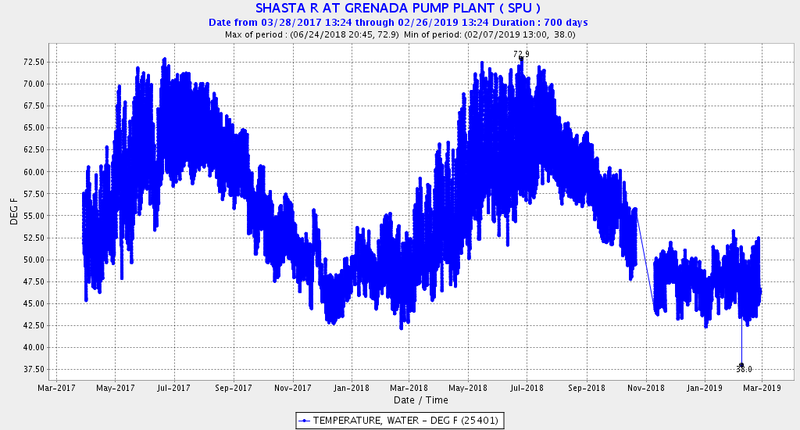 Water temperature in the Shasta River below Big Springs including summers of 2017 and 2018. Source: DWR CDEC.